We enjoy cruising at Christmas - no cooking, no planning, no decorating, just enjoying time together as an extended family. Last year during our Western Caribbean Christmas Cruise on the Rhapsody, we pre-booked this cruise. We were looking forward to it as we&apos;ve never been to the ABC islands. However, as we started looking at shore excursions, we found we were limited because we don&apos;t dive. We decided to just wing it at each port. More on that later. Miami proved to be a bit more difficult to get to - really having to fly from Atlanta rather than spend almost 4 days driving. But we flew into FLL and Uber-ed into Coconut Grove - the Hampton Inn there proved a great central location for exploring. We walked into the Grove for sightseeing and dinner the night before and the morning of our cruise, had a great private tour with John Simmons of Miami Native tours. He dropped us right at the port after several hours of highlights around Coral Gables and Miami. Embarkation was smooth in Miami and I appreciated the small cards RCCL gave out letting us know what was open for lunch and where things were as we boarded. Lunch in the Windjammer was a zoo that first day - I was disappointed they didn&apos;t offer limited service in the Sapphire Dining Room at least to alleviate some crowds. The Navigator itself is a beautiful ship. Public areas are well-decorated, offering comfortable seating options and stunning works of art. The Promenade is a nice touch but we found ourselves wishing it offered more variety of shops and restaurant/bars. We went to Two Poets for a drink shortly after sail-away and were surprised there was no food offered - even themed snacks would be a nice touch here & at Vintages (wine bar). My Black & Tan turned out pretty much all black, which was also a bit disappointing. Our assigned dinner was at 5:30 in the Sapphire and we enjoyed meeting our tablemates and server Raj and assistant waiter Sheik. Dinner was good, with 3-4 options in each category changing every night and the rest stable for the full 9 days. Some things could have been better - I ordered Vegetable Korma one evening and specified to Raj that I was not a fan of cauliflower, if they could limit the amount of that. I think he mis-understood as mine included 1 piece of carrot, a handful of peas, and all cauliflower. My husband&apos;s contained almost none of the white vegetable. 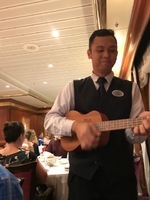 This was not the first time that happened, but we did enjoy their service, especially when Sheik brought out his ukulele and serenaded our table! Throughout the cruise, we dined in Chops for the Holiday Dinner Christmas Eve (which was amazing), Chops again for dinner on night 8 (which left much to be desired although our server Mummah(?) was fantastic), Sabor (Stephen was terrific), and the Chef&apos;s Table which was also a special treat. We had lunch on day 9 at Izumi which was also well-prepared. Windjammer was nice, although we found we did not find the variety we&apos;ve found before on previous RCCL travel. They offer a late-night snack at 9:30 of burgers, hot dogs, tacos, mac & cheese, pizza, fries. No major changes to this throughout the cruise. We know this because we were there every night, getting drinking water for our cabin. It seems like it was very difficult to find ice water on this particular RCCL ship - it&apos;s at the cafe in the Promenade, on the bar in the Solarium (although not cold), and in the Windjammer. As for Entertainment, they offered the usual variety of Trivia (which was hysterical thanks to Nicholas and Dominic as well as others on the Cruise Director&apos;s staff), shows (which varied and seemed to feature 3 nights of solo singers - a bit old after the first night), a Journey Tribute Band which was great, the Ice Dancing show (terrific! ), Magician (good), Comedian (didn&apos;t see him), and Juggler (great). A guest lecturer told us about the history of each port, but they moved her location several times making it hard to find and honestly, once found, she was not a great presenter. They also offered some mild hit movies at the pool and in the theater, but they were at odd times for our schedule (at the pool just after Formal Dinner) so we didn&apos;t catch any of them sadly. Movies in the cabin run $12 which was a little disappointing as sometimes that&apos;s a nice break after a few hours in the sun. The New Year&apos;s Eve celebration at 10pm in the Promenade a few nights before the real thing was actually a lot of fun, featuring live music and a huge balloon drop with stomping to pop! Public areas overall seemed a bit crowded during our 4 days at sea. The Cosmopolitan Club on 14 was a favorite hangout for us to read but it was frequently closed for private functions. The lounges on Deck 4 would have provided a nice area to sit and read, but the Casino smoke lingered too much to be comfortable for long. The R-Bar was a great spot to catch up on reading or iPad game playing, but was frequently filled with tweens playing loud games. This cruise seemed to have a preponderance of unsupervised tween groups - more so than previous holiday cruises - and this led to a lot of games of "stop at every floor" on the elevators as they ran from level to level, pressing buttons. As for lounges in the evenings, the R-Bar was easy access for a pre-dinner drink, but we were horrified by some of the concoctions they served us! Before our Holiday Chops meal on Christmas Eve, mom & I ordered Dirty Martinis. These came out with an odd yellow color. When asked, our server explained it was because of the olive juice. No. I enjoy dirty martinis, even make them at home on special occasions. Olive juice is not yellow. Yup, tasted like someone added limoncello to a dirty martini. The cosmopolitans they brought instead were perfect though. Mom ordered a Kir (not Kir Royal she explained to them) and it still came in a champagne glass with cherry. No. Finally, one of the last evenings, we ordered Cosmos again because they were good the first time. This time they came out cloudy with orange slices. Yup - cranberry juice and orange juice. Not a cosmo. So the bartenders there definitely need some help with cocktail craft, but service was good. 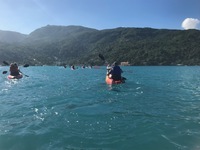 Shore excursions - the only ones we booked through the ship were on Labadee but the Kayak Adventure was well-executed and we enjoyed our time very much. We rented a clamshell (beach lounger for two) and a floating mat. Our tickets said to go to Adrenaline Beach but the Beach Loungers were a special section a good hike from there. There is a trolley to help get around the resort, but perhaps better directions would have helped. They gave us a hard time about getting a 3rd chair. There are 3 in my family - we&apos;ve always done this & rotated our time in the sun, but this time they were not as friendly. We still enjoyed our time & really liked the Labadoozie specialty drink. Pool - as usual, the empty towels on chairs flooded the pool deck each day at sea. I was impressed to see notes left on some "saved" that RCCL noted the time and said they would remove the items after X time. However, it was not consistent or enforced. Once, which reading in the Cosmopolitan Club for almost 2 1/2 hours, I eyed a set of 4 empty towel chairs in a prime sunny spot. One person came & sat on one for about 3 minutes while re-applying sunscreen, but they sat unwrinkled the whole time while I watched a woman fold a towel nearby to sit on the ground against a pole to take advantage of the sun. 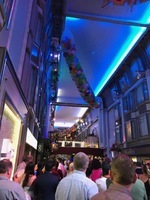 Overall, this cruise was enjoyed by all - from 15 1/2 to 75 1/2 year olds. We all felt very relaxed and caught up on a lot of reading. Bring games and your own entertainment - especially if you&apos;re not planning to gamble, surf, ice skate, or rock climb. I would recommend it, especially if you plan to take advantage of the diving opportunities in these islands. Well-done RCCL. 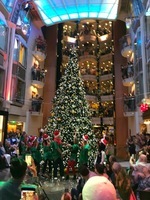 We enjoy cruising at Christmas - no cooking, no planning, no decorating, just enjoying time together as an extended family. Last year during our Western Caribbean Christmas Cruise on the Rhapsody, we pre-booked this cruise. We were looking forward to it as we&apos;ve never been to the ABC islands. However, as we started looking at shore excursions, we found we were limited because we don&apos;t dive. We decided to just wing it at each port. More on that later. Miami proved to be a bit more difficult to get to - really having to fly from Atlanta rather than spend almost 4 days driving. But we flew into FLL and Uber-ed into Coconut Grove - the Hampton Inn there proved a great central location for exploring. We walked into the Grove for sightseeing and dinner the night before and the morning of our cruise, had a great private tour with John Simmons of Miami Native tours. He dropped us right at the port after several hours of highlights around Coral Gables and Miami. Embarkation was smooth in Miami and I appreciated the small cards RCCL gave out letting us know what was open for lunch and where things were as we boarded. Lunch in the Windjammer was a zoo that first day - I was disappointed they didn&apos;t offer limited service in the Sapphire Dining Room at least to alleviate some crowds. The Navigator itself is a beautiful ship. Public areas are well-decorated, offering comfortable seating options and stunning works of art. The Promenade is a nice touch but we found ourselves wishing it offered more variety of shops and restaurant/bars. We went to Two Poets for a drink shortly after sail-away and were surprised there was no food offered - even themed snacks would be a nice touch here & at Vintages (wine bar). My Black & Tan turned out pretty much all black, which was also a bit disappointing. Our assigned dinner was at 5:30 in the Sapphire and we enjoyed meeting our tablemates and server Raj and assistant waiter Sheik. Dinner was good, with 3-4 options in each category changing every night and the rest stable for the full 9 days. Some things could have been better - I ordered Vegetable Korma one evening and specified to Raj that I was not a fan of cauliflower, if they could limit the amount of that. I think he mis-understood as mine included 1 piece of carrot, a handful of peas, and all cauliflower. My husband&apos;s contained almost none of the white vegetable. This was not the first time that happened, but we did enjoy their service, especially when Sheik brought out his ukulele and serenaded our table! Throughout the cruise, we dined in Chops for the Holiday Dinner Christmas Eve (which was amazing), Chops again for dinner on night 8 (which left much to be desired although our server Mummah(?) 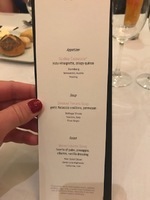 was fantastic), Sabor (Stephen was terrific), and the Chef&apos;s Table which was also a special treat. We had lunch on day 9 at Izumi which was also well-prepared. Windjammer was nice, although we found we did not find the variety we&apos;ve found before on previous RCCL travel. They offer a late-night snack at 9:30 of burgers, hot dogs, tacos, mac & cheese, pizza, fries. No major changes to this throughout the cruise. We know this because we were there every night, getting drinking water for our cabin. It seems like it was very difficult to find ice water on this particular RCCL ship - it&apos;s at the cafe in the Promenade, on the bar in the Solarium (although not cold), and in the Windjammer. As for Entertainment, they offered the usual variety of Trivia (which was hysterical thanks to Nicholas and Dominic as well as others on the Cruise Director&apos;s staff), shows (which varied and seemed to feature 3 nights of solo singers - a bit old after the first night), a Journey Tribute Band which was great, the Ice Dancing show (terrific! ), Magician (good), Comedian (didn&apos;t see him), and Juggler (great). A guest lecturer told us about the history of each port, but they moved her location several times making it hard to find and honestly, once found, she was not a great presenter. They also offered some mild hit movies at the pool and in the theater, but they were at odd times for our schedule (at the pool just after Formal Dinner) so we didn&apos;t catch any of them sadly. Movies in the cabin run $12 which was a little disappointing as sometimes that&apos;s a nice break after a few hours in the sun. The New Year&apos;s Eve celebration at 10pm in the Promenade a few nights before the real thing was actually a lot of fun, featuring live music and a huge balloon drop with stomping to pop! Public areas overall seemed a bit crowded during our 4 days at sea. The Cosmopolitan Club on 14 was a favorite hangout for us to read but it was frequently closed for private functions. The lounges on Deck 4 would have provided a nice area to sit and read, but the Casino smoke lingered too much to be comfortable for long. The R-Bar was a great spot to catch up on reading or iPad game playing, but was frequently filled with tweens playing loud games. This cruise seemed to have a preponderance of unsupervised tween groups - more so than previous holiday cruises - and this led to a lot of games of "stop at every floor" on the elevators as they ran from level to level, pressing buttons. As for lounges in the evenings, the R-Bar was easy access for a pre-dinner drink, but we were horrified by some of the concoctions they served us! Before our Holiday Chops meal on Christmas Eve, mom & I ordered Dirty Martinis. These came out with an odd yellow color. When asked, our server explained it was because of the olive juice. No. I enjoy dirty martinis, even make them at home on special occasions. Olive juice is not yellow. Yup, tasted like someone added limoncello to a dirty martini. The cosmopolitans they brought instead were perfect though. Mom ordered a Kir (not Kir Royal she explained to them) and it still came in a champagne glass with cherry. No. Finally, one of the last evenings, we ordered Cosmos again because they were good the first time. This time they came out cloudy with orange slices. Yup - cranberry juice and orange juice. Not a cosmo. So the bartenders there definitely need some help with cocktail craft, but service was good. Shore excursions - the only ones we booked through the ship were on Labadee but the Kayak Adventure was well-executed and we enjoyed our time very much. We rented a clamshell (beach lounger for two) and a floating mat. Our tickets said to go to Adrenaline Beach but the Beach Loungers were a special section a good hike from there. There is a trolley to help get around the resort, but perhaps better directions would have helped. They gave us a hard time about getting a 3rd chair. There are 3 in my family - we&apos;ve always done this & rotated our time in the sun, but this time they were not as friendly. We still enjoyed our time & really liked the Labadoozie specialty drink. Pool - as usual, the empty towels on chairs flooded the pool deck each day at sea. I was impressed to see notes left on some "saved" that RCCL noted the time and said they would remove the items after X time. However, it was not consistent or enforced. Once, which reading in the Cosmopolitan Club for almost 2 1/2 hours, I eyed a set of 4 empty towel chairs in a prime sunny spot. One person came & sat on one for about 3 minutes while re-applying sunscreen, but they sat unwrinkled the whole time while I watched a woman fold a towel nearby to sit on the ground against a pole to take advantage of the sun. Overall, this cruise was enjoyed by all - from 15 1/2 to 75 1/2 year olds. We all felt very relaxed and caught up on a lot of reading. Bring games and your own entertainment - especially if you&apos;re not planning to gamble, surf, ice skate, or rock climb. I would recommend it, especially if you plan to take advantage of the diving opportunities in these islands. Well-done RCCL. This was by far the most spacious balcony cabin we&apos;ve had on any ship. I think moving the sofa/vanity area to the entryway past the bath makes a big difference - allowing the bed to be closer to the sliding door. Storage was fantastic with hidden cubbies and shelving in the closet. Took a cab to Eagle Beach. Rented an umbrella & chairs and ate seafood at the restaurant on the beach. Terrific. Great way to see the island on our own time. We could stop when we wanted, explore as much as we wanted. Bring lots of sunscreen and re-apply as it was sunny that day and we got a little pink on the sides of our legs. Just found a local bus tour at the port for $20 pp - lasted 2 hours with a stop at the distillery. Had lunch on our own at a local restaurant and walked back to the ship. Nice tour and beautiful island. Good overview, customized to our interests.